Gravity defying hair for the win! When I started crafting for costumes I learned a great deal about budgeting my time and money. This is where the "cheaply available" part comes in. Worbla, wonderflex, and real leather are amazing materials to work with but they also have a steep price. As a beginner, and doing part-time school and work, I had to figure out how to make things without the fancy materials. I went to Thrift Stores, learned about the wonders of craft foam, and tried different ways of making things that I do not think professionals would even give a second thought to. When a costumer cannot afford the nicer things they get creative. 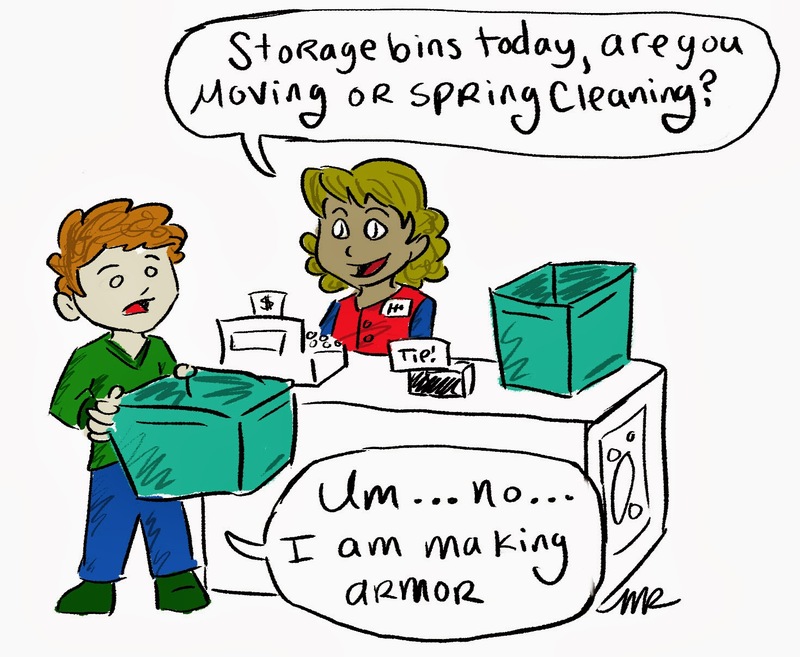 It is fun to have these conversations with the cashiers at various stores. Why do we cosplay? It starts with being a fan of something. Some people make fan art, some write fan fiction, and others become the heroes and characters that they look up too. All of these are ways of expressing an appreciation for a hero or story. 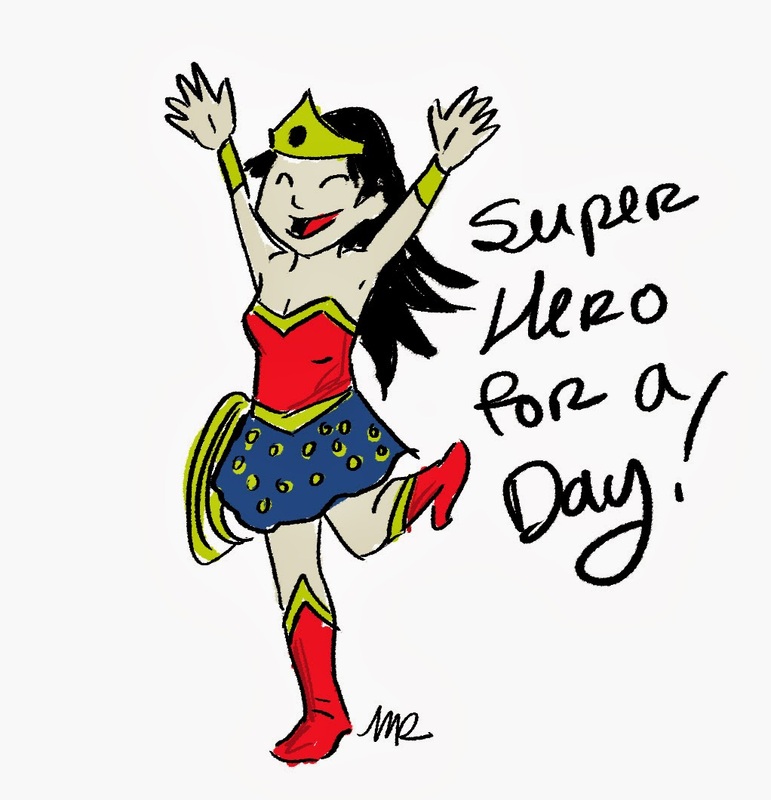 Dressing up as Wonder Woman or Batman, becoming the hero or character you relate with and love... it can be so much fun! We go to a convention and see people having a great time dressed up as characters. It is no wonder that people are drawn to it. I imagine that this is one of my aunts. She loves Wonder Woman! This brings me to a very important reason for costuming: fun! In any hobby, serious or casual, the element of fun must be there or why do it at all? My father loves cars. He enjoys going to car shows, designing cars, and working on his latest vehicle for fun. Some of this "fun" even got him cool jobs in the past, but even without those jobs, he enjoys what he does with his hobby. This applies to cosplay as well. I should say especially so, because the last costume I worked on had my fingers sore from sewing, my back aching from leaning over a machine, and some severe lack of sleep. It was all worth it because I had fun the whole way, but if I was not having fun depriving myself of sleep... well I wouldn't keep doing this. 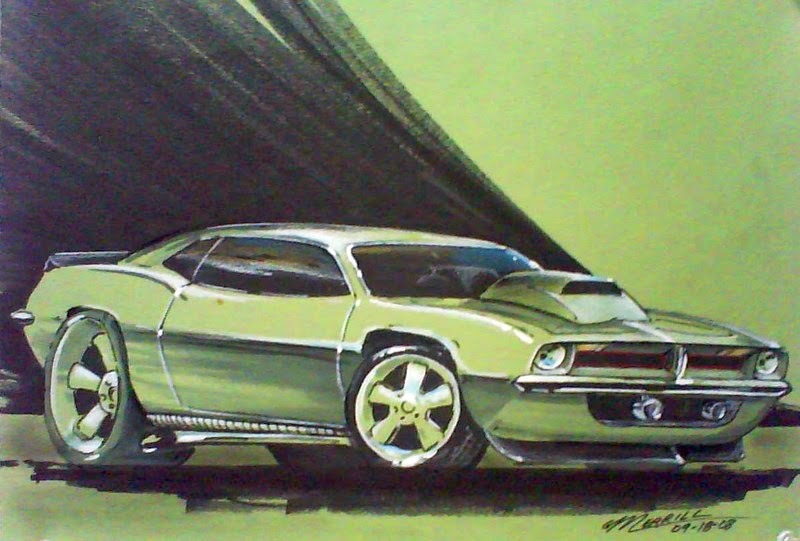 I wish I could draw cars like my dad. He is awesome. 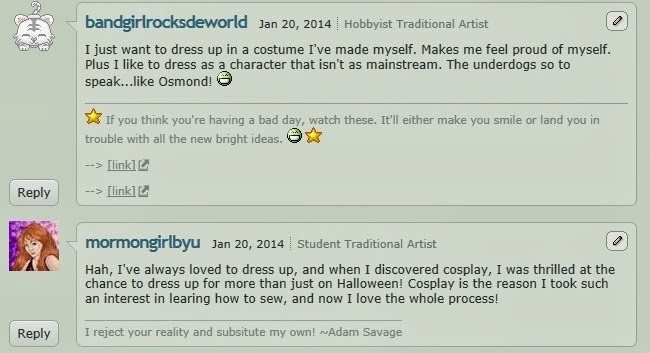 Every cosplayer has different reasons aside from the two mentioned. It varies greatly for everyone I have asked. Some costumers love the hobby for the acting! They enjoy stepping into someone else's shoes and bringing that character to life. They strive to bring out the spirit of the character. Some will use this acting skill to make a child's day. H.E.R.O.I.C. Inc, volunteers their time and costumes to helping charities and making a less-than-fortunate child's day amazing. 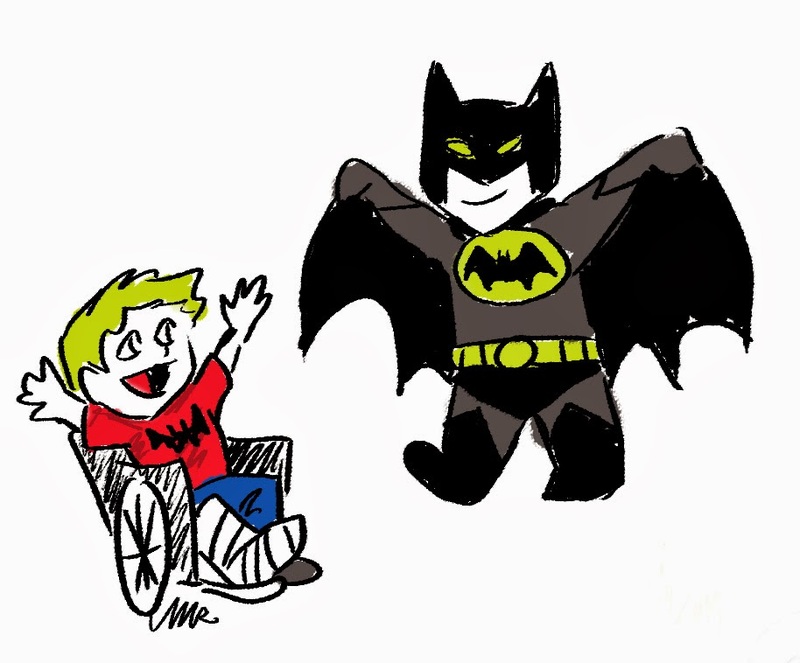 A kid with autism or down syndrome can have the chance to meet their heroes. Being able to pull off a character and make a person happy is a good feeling. It is even better, in my opinion, when you make a child smile. Another reason to cosplay is to revel in the craftsmanship. You can learn new, real life skills in this hobby if you only apply yourself. Sewing, wood craft, engineering, metal working, and problem solving are just a few. How many people do you know that can use a sewing machine properly? If you are a costumer, probably plenty. If not, then maybe you might know a few people, if any at all. If you had asked me in high school if I would ever sew, I probably would have laughed at you. I was a mechanical engineer! I did not do girly things like sewing... well now I know better. Sewing is awesome and so is wood craft, metal working, and leather craft! 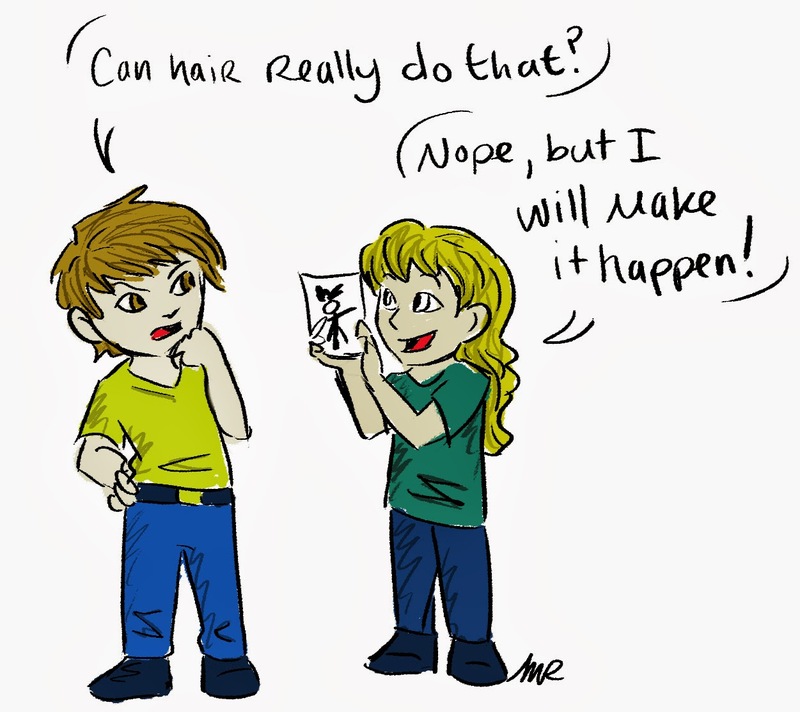 The skills you can learn as a costumer can be endless. There are plenty of reasons for costuming out there and all of them are as different as the person participating in the hobby. I personally enjoy learning new skills and pushing myself to try bigger and better challenges. Why do you cosplay? Go ahead and comment below. I would love to hear your stories. 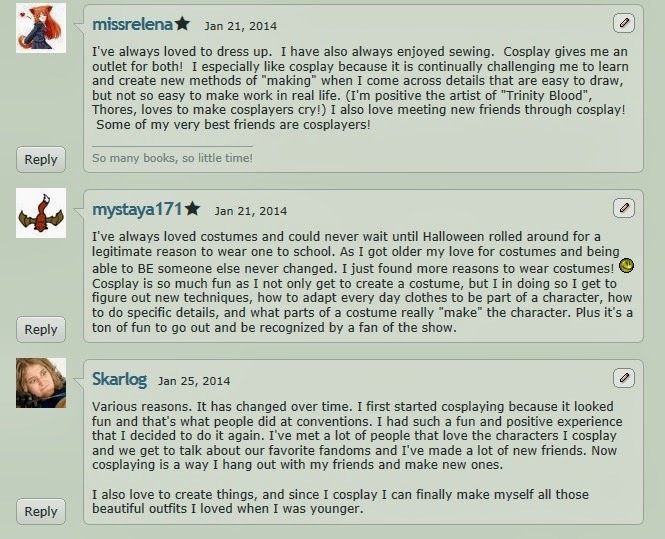 Here are some quotes from Deviantart when I asked why some cosplayers do what they do.